Sickle cell anaemia and β-thalassaemia are two common haemoglobinopathies. Co-inheritance of the two is called sickle β-thalassaemia. Sickle β-thalassaemia seen in Africa, throughout the Mediterranean, Arabian Peninsula and sporadically in india. It has heterogeneous clinical presentation. The severity depends on the severity of the thalassaemia allele and the extent to which the impaired haemoglobin synthesis is compensated by foetal haemoglobin synthesis. With a very few exceptions (Blood 1989; 74: 1817-22) the sickle cell and the thalassaemia gene are arranged in trans i.e on different chromosomes (βs/βthal). One allele is inherited from the mother and one from the father. One parent carries the a β-thalassaemia trait the other parent has a sickle cell disease that may be sickle cell anaemia, sickle β-thalassaemia or a trait. Sickle β-thalassaemia in Africa and India/Arabia is mild whereas the patients from the Mediterranean region have severe disease. As mentioned above the differences in severity have to do with severity of the β-thalassaemia and the degree to which the impaired haemoglobin A synthesis is compensated by HbF. Weatherall suggested that patients with HbA <15% follow a course similar to severe HbA and those with HbA 20-30% follow a mild course. African sickle β-thalassaemia: African patients have a mild β-thalassaemia resulting in a relatively higher HbA level and a lower risk of sickling. These patients run a mild clinical course. Arab/Indian sickle β-thalassaemia: Patients from India and the Arabian peninsula have a sickle cell haplotype that is associated with a high HbF production. The HbF retards sickling. High levels of HbF attenuate symptoms. Patients carrying this haplotype have mild symptoms even when the inherit a severe β- chain defect. Another reason of a mild phenotype in India is the interaction with α thalassaemia. Mediterranean sickle β-thalassaemia: Mediterranean patients usually inherit a severe form of β-thalassaemia. These patients have severe sickling because there is very little HbA or HbF to offset inhibit the crystallisation of HbS. Despite only one chromosome carrying HbS the phenotype of these patients resembles sickle cell anaemia. The features of sickle-β thalassaemia resemble those of other sickling disease. It is a chronic haemolytic anaemia the course of which is interrupted by acute exacerbations known as crisis. The manifestations include haemolytic anaemia, painful and other crisis, leg ulcers, priapism and complications of pregnancy. The severity of symptoms is variable. One end of the spectrum are patients, usually of origin Mediterranean descent, whose presentation is indistinguishable from sickle cell anaemia. These patients have inherit severe forms of β (β0) chain defects. Those with sickle cell-β+ thalassaemia have milder symptoms. These patients are typically of African ancestory. Unlike patients with sickle cell anaemia patients with sickle-β thalassaemia may have splenomegaly that is more prominent patients with sickle cell-β+ thalassaemia. The spleen is usually moderately enlarged but massive splenomegaly that may be associated hypersplenism neccesisating splenectomy has been reported. The effect of co-inheritance of α-thalassaemia is small. A decrease in the frequency of acute chest syndrome and leg ulcers and a higher persistence of splenomegaly is seen. Co-inheritance of α thalassemia is one of the reasons that sickle-β thalassaemia runs a milder course in India (the other being the high HbF due to the Arab-Indian haplotype of HbS). The haematological findings vary with severity. More severe phenotypes shows greater anaemia, lower MCHC, higher reticulocytes, HbF and HbA2. A variable number of sickle cells may be found. Unlike sickle cell anaemia both forms of sickle cell-β thalassaemia have an elevated HbA2. The distribution of HbA2 is very similar to heterozygous β thalassaemia. The levels of HbF are variable. High levels are found in patients with the Arab-Indian and Senegal haplotype of HbS. Sickle cell-β0 thalassaemia needs to be differentiated from sickle cell anaemia. The presentation of both may be identical. However an offspring of a sickle cell-β0 thalassaemia patients and a carrier of β-thalassamia trait has a 25% risk of suffering from β-thalassaemia major. The offspring of a patients with sickle cell anaemia and a carrier of β thalassaemia trait does not carry the risk of β thalassaemia major. Though sickle cell-β0 thalassaemia is characterised by an elevated HbA2 and splenomegaly this can not be relied upon to differentiate between the two conditions. Family and DNA studies are needed. If the studies show one parent to be heterozygous for HbS and the other a carrier of β thalassaemia trait no further studies are needed. If any of the parent has a phenotype of sickle cell anaemia DNA studies may be the only way to make the diagnosis. Almost all patients with sickle-β thalassaemia have the disorder in trans i.e. the one β globin gene is thalassaemic and the other has a the sickle mutation. Patients with HbS and thalassaemia gene in cis have been described. 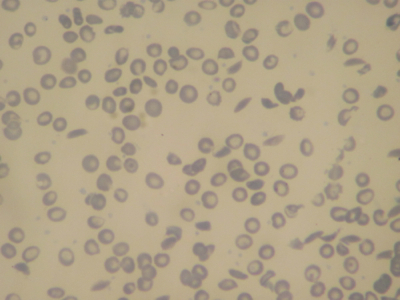 These patients have a mild hemolysis, HbA2 levels were 6%–7%, HbF approximately 3% and HbS of 10%–11%. The symptoms of sickle-β thalassaemia are due to sickling need to be treated accordingly.